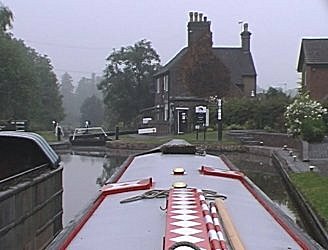 Neil left Hartshill solo at 6.00 and arrives at Atherstone Top Lock at 6.55, predictably locks empty! Neil was very good and shut all gates behind him. 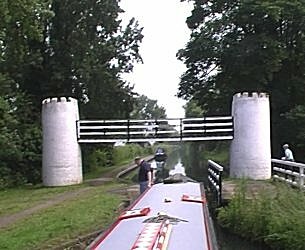 At lock 7 (8.30) Neil had a quick wee stop and decided to try to make a cup of tea, but was soon disturbed by Mel Batchelor, they were on the way up in Mountbatten and Jellico! Neil exchanged a few words with the Batchelor's, they said I should get more organised in the art of solo cruising! After this it was plain sailing as the locks were all set by the few early starters ponded up behind them. 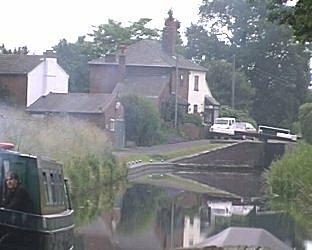 Neil reached Atherstone bottom at 9.30, after going straight into every one of the last locks. Neil stopped on water point at Br48 between 9.40 and 10.55 to fill with water and wash off BW Braunston strimmings. Dave Heamon in Raven, also solo, passed me while getting water and we had a brief chat. Due to good progress Neil phoned Julian E and altered drop off point to Br 52 Polesworth. Neil arrived at Polesworth at11.30 and gave the boat a basic clean up. Jackie arrived at 12.30 with the crew, Julian E, Colin and Dan. Gavin would meet as later as he was still having divorce problems! We went to the Royal Oak, in the middle of the Polesworth carnival, much water was sprayed around the bar! At point we were alone in the pub, Julian E nearly pulled us another free round! We eventually shoved off at 14.25. 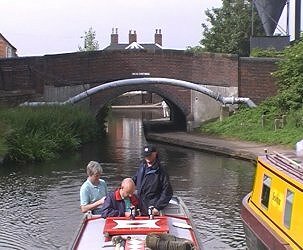 Glascote Bottom lock was passed at 16.50 and we eventually arrived at Fazeley Junction and the start of the BCN Challenge at 17.25. 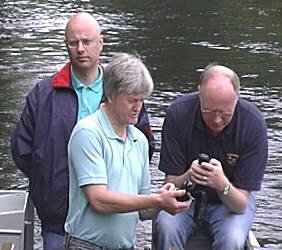 It was at this point that Julian E (steering) complained that he could not here the clubs theme tune (Justified and ancient - KLF) Colin arranged a mobile phone radio link for him! Curdworth Bottom lock was entered at 18.25 and we arrived on the (shallow, 2ft2ins!) visitor moorings between locks 8 & 9 for the Dog and Doublet pub. We just managed to get a table. It was at this point Julian E found that he had lost his wallet! Amazingly it was found in the pub at Polesworth. There followed much mobile phoning and Julian eventually shot off in a taxi and was back just as his steak was ready! Amazingly Julian's wallet, still contained everything, including the GBP 160! 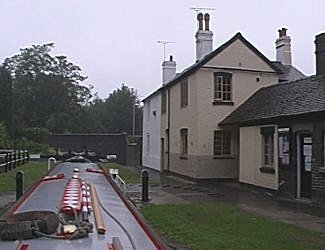 The pub was packed and though much extended from our earlier visits proved to be still OK.
Atherstone Top Lock. 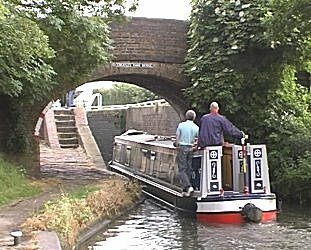 Coventry Canal. 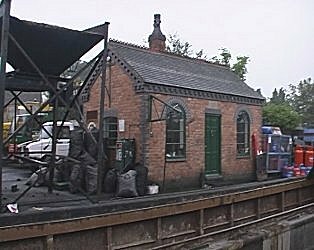 The coal depot, which also loads the commercial narrowboats. 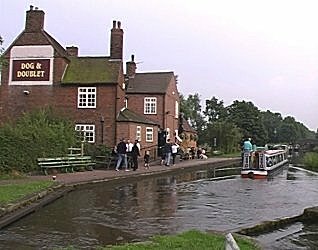 Atherstone Top Lock. Coventry Canal. 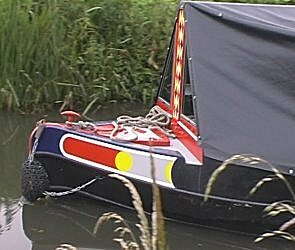 Boat on auto pilot, will Neil get to it in time! Atherstone Flight. Coventry Canal. 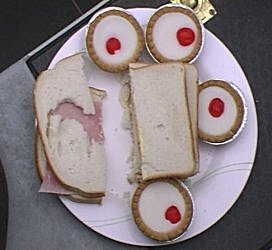 The Batchelor's Butty - Mountbatten. Atherstone Flight. 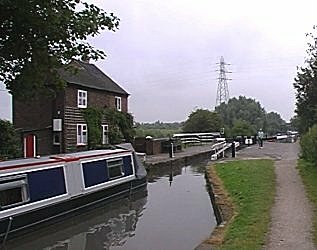 Coventry Canal. The crew arrive, Colin, Danny and Julian E. Confusion on how to set up Dan's new phone! One of Dan's cobbled together snacks! 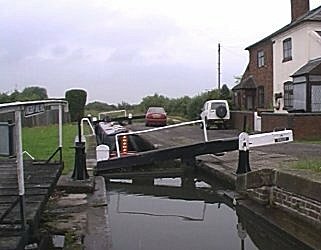 Glascote Top Lock, Tamworth. Coventry Canal. 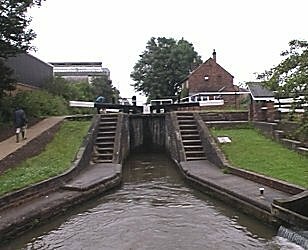 Glascote Locks, Tamworth. Coventry Canal. Glascote Bottom Lock, note jolly little hut over by-weir! Tamworth. Coventry Canal. 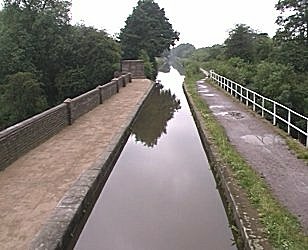 Tame Valley Aqueduct. Tamworth. Coventry Canal. 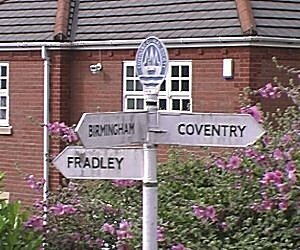 Fazeley Junction with the Birmingham and Fazeley Canal. Dan starts to "lay in" to Colin. The bickering was to last all week! 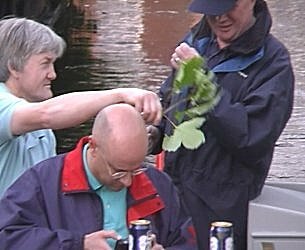 After sorting out everybody's Mobile Phone, Colin now turns to Linda's camera. Drayton Manor Footbridge. 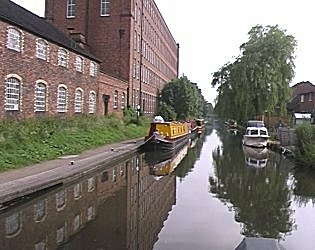 Birmingham and Fazeley Canal. 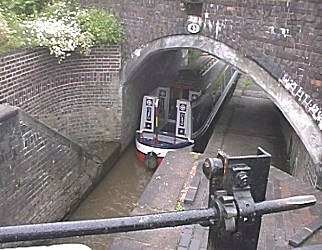 Curdworth Bottom Lock. The bloke is apparently NOT setting fire to his boat, it is a barbeque! Birmingham and Fazeley Canal. 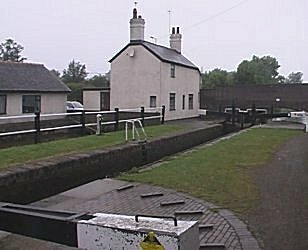 Curdworth Bottom Lock. Birmingham and Fazeley Canal. Lock No9, Bodymoor Heath. Birmingham and Fazeley Canal. The Dog and Doublet, our venue for the night. Bodymoor Heath. 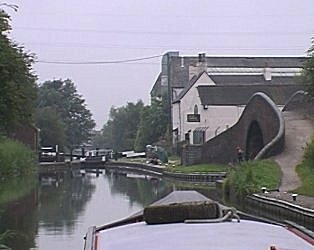 Birmingham and Fazeley Canal. Earnest looks very purposeful, with it's temporary deep draught!